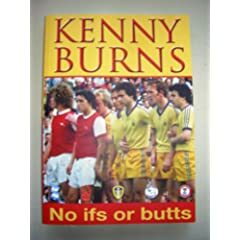 Kenny Burns: No Ifs Or Butts | Through the seasons before us.. Being a fan too young to have had the pleasure of seeing Kenny representing Forest, it perhaps has less resonance for me than some of you who will have real memories of some of his antics. I avidly consume Forest books, and this was an entertaining read courtesy of the big fella. Anyone who’s had the pleasure of hearing Kenny speak at ‘Evening with’ nights or after-dinner speaking (or indeed, those of you who might’ve actually met him!) will know he’s a witty fellow, very dry and sarcastic – which is ace. And that shines through in the book, this isn’t an overly polished ghost-written number – it reads like you’d imagine Kenny telling the stories. I suppose the only part of the book that didn’t quite do it for was the reasonably frequent descent into listing results in a particular season – but that’s a small quibble, there’s plenty of amusing tales from Kenny’s time at Birmingham, through Forest and then beyond into where I hadn’t realised quite how long he was still playing non-league football. A nice account of one of Forest’s unquestionable stalwarts in our most successful era- definitely worth having a read – I’m sure it’ll raise a few chuckles along the way too. Next up is the more daunting illustrated history of Forest I was generously given as a Christmas gift. Can’t wait! Enjoyed the book also & found it a very easy and interesting read. As you’d expect from Kenny he pulls no punches & whilst clearly not in the same league as Adams/Cascarino’s/Keano’s autobiography it is DEFINITELY worth a read. With Kenny what you see is what you get & whilst bizarely I don’t feel as though I know much more about him than I did before I read the book, he is forthright & entertaining. Up the Reds & wrap up tonight you mighty Tricky Tree fans!!!!! I have to say whist I meet Kenny, at the Donny game and had me pix taken with him and big ears, and like him immediately it’s a dull read. What is refreshing is he gives his honest opinions. The Illustrated book is good though we must have the same relatives, this one was signed by Bomber! Hi can anyone point me in the right direction on locating a stockist for this book? Tried ordering from Amazon for Christmas and have just been told the publisher has stopped publishing it. Only found it on eBay! Only a tenner though, not too bad! Having read the book, very disappointed that he feels he has to air his dirty washing in public. I found it amazing the selective memory he holds. Alot of the truth was left out and there was no mention of his temper of the pitch either. Its a shame he doesnt know which daughter is which in the photos. Oof. Difficult to comment on the more personal side of things, although much of it read very insensitively! Must be difficult to read such things when the subject matter is so close to home, so to speak.